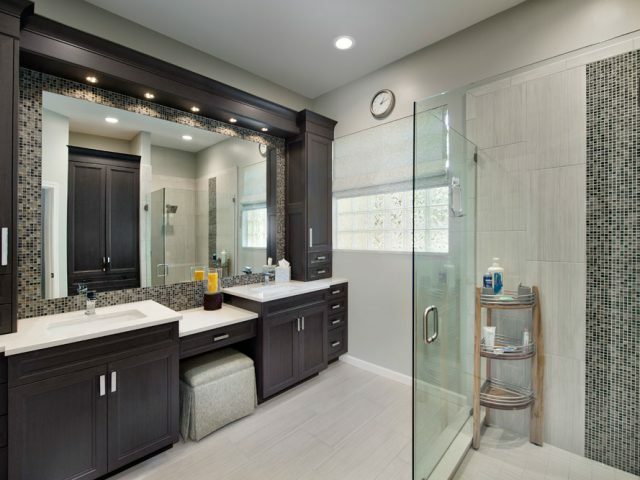 This master bath project transformed a dark and dated bathroom into a bright and airy functional ensuite. 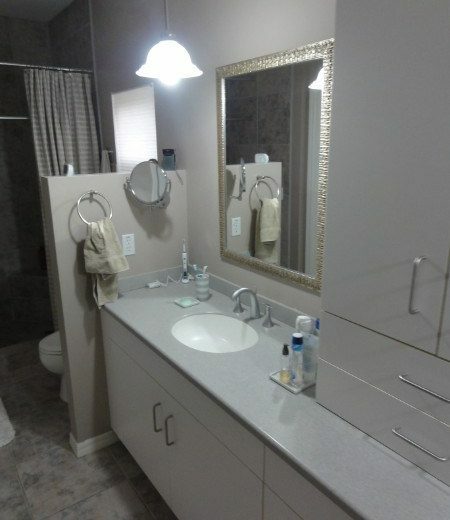 The builder grade cabinets were replaced with custom built cabinets witha backlit mirror. 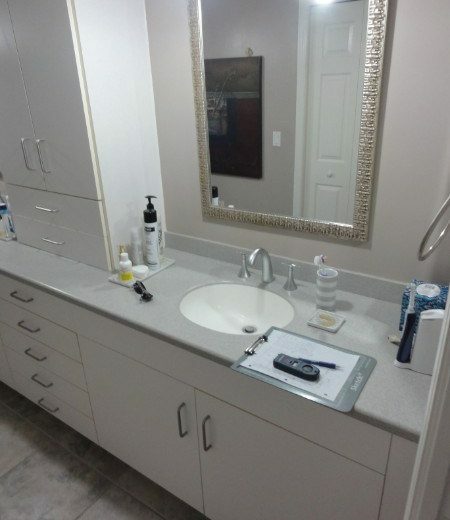 The new vanities and built-in custom storage gave the bathroom a luxurious feel while being extremely functional. The shower door was removed and replaced with a more modern style. The glass in the entry and closet doors were also updated to a reeded glass for a more contemporary feel. The owners wanted to keep the foot print of the bath the same but update everything to be more contemporary. We left the existing floor tile and also in the shower. We added an oversized LED backlit mirror surrounded by mosaic tile that complimented the floor tile. 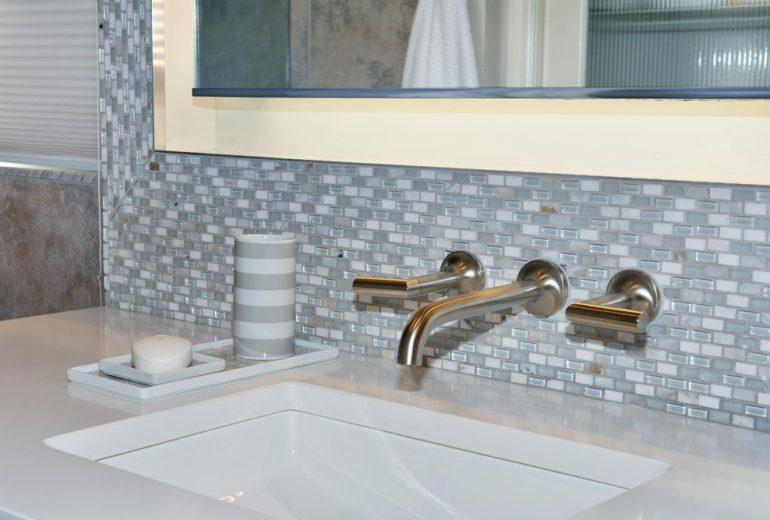 The Kohler faucets mounted in the wall, as well as the square under-mount sinks, gave the contemporary feel the customer wanted. The ‘his and her’ vanities have a four-drawer cabinet close to each sink and each witha laundry cabinet. When this Bonita Beach client came to us, they had just purchased their condo that was directly on the beach. Although the condo had perfect Gulf views, it was very dated and out of style. When this Pelican Bay client came to us they were tired of the dated and old look of their 1980's condo. Now look at their Naples home! 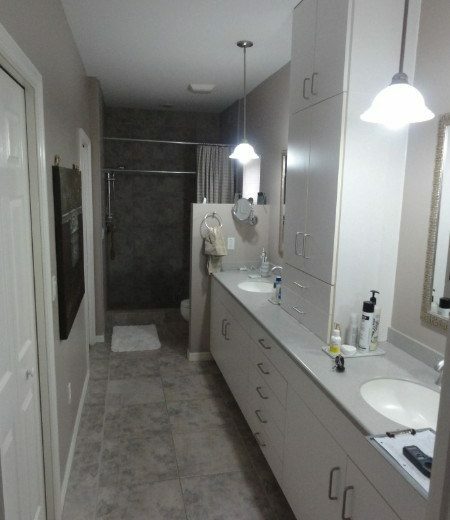 This was a condo that was just purchased and in need of a new kitchen and two new bathrooms. We transformed the space into something special. WHAT KIND OF A PROJECT IS ON YOUR MIND? Get a helpful, complimentary consultation. We remodel and build new homes in and around Naples, Florida. If you live in the Naples area and are considering remodeling your home, we’d love the opportunity to listen to what you have in mind and introduce you to our five point promise.